Our first chapter meeting of the year will be held at Wolverine State Brewing at 7:00 p.m on Tuesday, March 19th in the Gulo Room. The address for Wolverine State Brewing is: 2019 W Stadium Blvd, Ann Arbor, MI 48103. More info will be posted closer to the date. Hope to see you there! Please purchase a grooming badge and sticker from us for $25 if you use the groomed trails at DTE this winter. All badge proceeds go into grooming costs – fuel, equipment maintenance, etc. Grooming badges will be mailed out on Friday of each week. Please display them proudly, hanging them from your saddle, pack or jacket so that everyone can see you are a supporter! This winter, the Potawatomi Mountain Biking Association is embarking on an effort to give DTE Energy Foundation Trail users an epic “Four Season” trail experience. We have planned out three groomed loops at DTE to give fat tire bikers, cross-country skiers and snowshoers the ultimate winter flow trail experience. The three loops will include all of the Green Lake Loop, the “lowland” parts of Big Kame just west of Green Lake Loop, and (hopefully!) all of the 8 mile Winn Loop which formally opened last August. These three groomed loops – Green Lake (5.2 miles), Kame Lowlands (just over 1 mile) and Winn Loop (8 miles) – will provide just over 14 miles of winter groomed trail to explore. 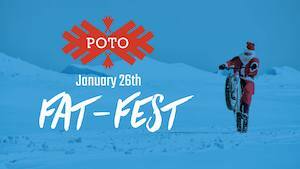 The Poto Chapter uses a snowmobile and a recently purchased Snowdog track sled to groom with two different propriety singletrack groomers designed by Helzemco, a design, prototyping and fabricating engineering firm located just north of Chelsea. The Snowdog groomer cost around $4,000. Add to this the costs of fuel for the groomers and parts, maintenance and labor, and grooming becomes a worthwhile, but costly endeavor! For this reason, we are asking you, our groomed trail users, for targeting giving to fund the costs of grooming at DTE. If you are a regular groomed trail user at DTE, please consider donating to the cause. This is best done by clicking below and paying directly into our DTE Trail Grooming Fund. The groomed portions of the trail have just recently been marked with maps and directions. Look for signage and maps on the trail and at the trail head off M-52. 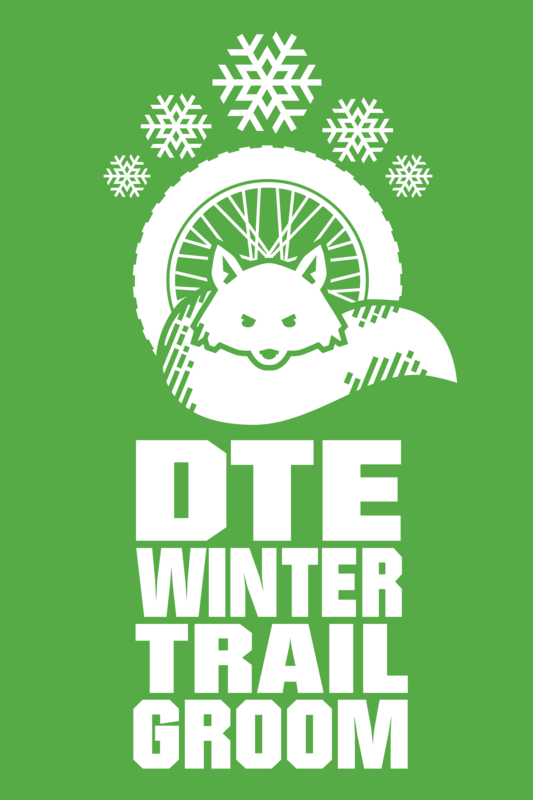 We will also soon be identifying each of the three loops with the DTE Winter Trail Groom Arctic Fox logo on this page. Green Loop will be marked with fluorescent green versions of the logo, Kame Lowlands with fluoro blue and Winn with fluoro orange. We will also be posting more information on groomed trail etiquette on the trail head kiosk. What is “Winter Groomed Trail Etiquette”? ONLY OPEN FOR USE BY FAT TIRE BIKERS, CROSS-COUNTRY SKIERS AND SNOWSHOERS. The equipment utilized for these uses all create “floatation” which suspend the user on the top of the trail tread without “breaking through”. We respectfully ask that normal foot and narrower tire mountain bikes stay off the groomed trail and turn their use to the plethora of other non-groomed trails and pathways in the local area. Fat tire bikes should be over 3.8” in width, and run under 10 p.s.i. in each tire (around 5 p.s.i. is typical). Enjoy your winter trail experience! Follow link below to donate to the DTE Trail Grooming Fund. Missed out on a shirt at the Triple Trail Challenge? Pre-Order one here. Did you know that the Poto MBA’s trail maintenance needs are higher than EVER before? 1) Our chapter has more trail mileage than ever before! AWESOME!!! But, it’s a significant increase in maintenance for an extremely small volunteer base. 2) We still have trail to build at DTE. But, the Green Lake and Big Kame loops are now well established and have transitioned into maintenance mode. 3) Lastly, many of our chapter’s flagship trails are on state land where precautions are in place to protect the threatened Massasauga rattlesnake. What does this mean for us? We have to maintain the trail corridors on a much more frequent basis, and this is a SIGNIFICANT amount of work. More than ever before. The TC’s really need help with this. We are actively seeking YOUR help. This means you! And your brother. And your friends. And their friends, too. If you would like to help, please send an email to volunteer@potomba.org and indicate which trail you want to help maintain. Your message will be forwarded to the appropriate Trail Coordinator. Help is needed at DTE Energy Foundation Trail, too! For DTE, we have developed maps (Green Lake map and Big Kame map) for section adoption and a Sign Up Genius for volunteers. Reserve your section today before it’s gone!! You may also email volunteer@dtetrail.org if you have questions specifically about maintenance needs at DTE. The Potawatomi Mountain Biking Association is proud to announce our partnership with Bicycle Alliance of Washtenaw. Their mission is to foster better bicycling opportunities and outcomes in and around the greater Washtenaw area by sharing the collective resources and knowledge of area organizations and enthusiasts. Look for future Poto chapter events on the official BAW calendar. BAW has a a local summit planned on February 11th in Ann Arbor during which they will discuss actionable solutions for the upcoming year around the themes of Community, Culture, Education, and Infrastructure. Consider participating in the summit to bring some mountain biking perspective to the table. This would be an excellent opportunity to have a break out session to discuss trail ettiquette education, for example. Hope to have some Poto MBA representation there. December 9, 2017, 12 p.m. Event content: Join us at the 2017 Abominable Snowman Ride at HIGH NOON on Saturday, December 9th at the Glenbrook Yurt in Pinckney Recreation Area. Ride as much or as little of the Poto trail as you would like. There are many options! Woody will have chili ready for the riders and he’ll have the fire going. The griddle will be ready as well for any hot dogs you’d like to bring. Cold temps and snow have been ordered for the weekend. Please bring wood to help keep the fire burning into the evening. 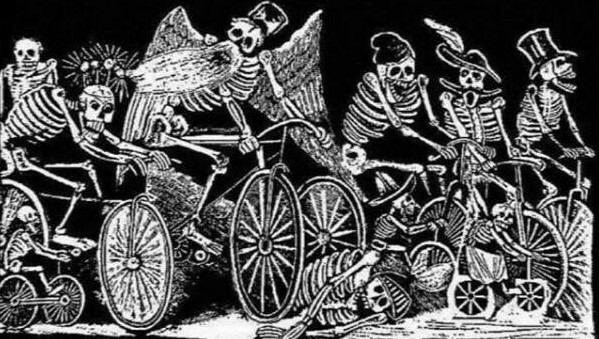 Join the POTO Chapter as they lead a fun group ride on Black Friday. After the ride Wheels In Motion will provide pizza and beer! Come out to the 9th Annual Black Friday MTB Ride at Rolling Hills and Hewens Creek Parks in Ypsilanti Township on Friday 11/24 at 10 AM. This will be a no-drop group ride and is a great chance for novice MTBer’s to get exposure to single track riding and be a fun way to burn off that Thanksgiving feast and get a jump start on getting fit for 2018. The ride will be about 14 miles long covering ~6.0 miles at Hewens Creek and ~7.0 miles at Rolling Hills along with some connecting road & trail between the two parks. For those who haven’t ridden or rarely ride at either trail, Hewens Creek is a flat, winding ride through meadows and new growth forest which is great for beginning riders. The RHP trail on the other hand twists and turns through 4+ miles of forest and rolling hills that provide a great opportunity to improve your bike handling skills and 2.5+ miles of open meadows. The 1.2-mile West Meadows loop on the west side of RHP includes beautiful open meadows and some fun pump-track like riding on the Munger Mounds. Meet at the Rolling Hills Lodge at 9:45 AM and then we will head out by 10-10:15 AM. After the ride, we will have some pizza and refreshments at The Lodge at about 12:30 PM. Rain date will be Saturday 11/25 at 10 AM. Please register in advance at Event Brite to attend so a good estimate of riders can be made for the pizza and beverages. Look for changes in schedule on the Rolling Hills or Hewens Creek forums on the MMBA website or the Poto MBA Facebook page or Poto MBA Twitter account. Please park in the MTB trail head parking lot: enter the park, go straight through the traffic circle and park in the first lot on your right next to a big pavilion ~1/4 mile west of the circle. The Lodge will be about 200 yards away on your left. There will be a gate charge to enter RHP. It is a Washtenaw County Park so if you already have WCP sticker you are good to go. When: Saturday, October 28th, 12:00 p.m. – 6 p.m.
What: The PSSWC is an unsupported group ride around the Potawatomi Trail. This is not a race. Ride the Poto, backwards, at night on October 13th! The Batman Ride will be staging at the Silver Lake Parking lot. Arrive at 7:00pm and ride at 7:30pm. We will have a first group of faster riders doing the full loop, and a second group of “normal” riders doing part of the trail. After the ride, we will have a campfire and typically riders bring food to share. Come out and ride the Poto backwards with lights!